At the recent Association for Education in Journalism and Mass Communication conference in Chicago, professors learned practical skills from colleagues who use mobile devices to create multimedia content, including podcasts and other forms of audio journalism. According to Edison Research, 86 percent of Americans over 13 listen to audio in a typical day (see more Edison podcast research). But with a smartphone, you can do more than just listen. You could report from any remote location or just share your thoughts with the world in minutes. Students are already familiar with their mobile devices and will pick up these intuitive apps quickly. Producing an elaborate podcast via a smartphone might be a bit frustrating because of the size of the device, particularly if you’re using a smaller device. You could, however, produce a man-on-the-street segment, also known as a vox pop, with your phone and an app. This is an ideal in-class assignment or an opportunity for student media to add audio content to their platforms. You could whip up a live show, too. Facebook is making that easier with the rollout of Facebook Audio. On a mobile device, choose the Facebook Live video option, and then tap the ellipsis button on the lower right of the screen to select the “Live Audio” version. If you’re really crafty and do a bit of pre-planning, you could produce audio coverage of conference sessions or meetings in the same way. After you’ve alerted all parties that you’ll be recording, listen for soundbites/actualities. Instead of stopping the recording, glance at the recording and note the timestamp for future reference, which will help to speed up your post-production process. Finally, you could produce companion audio to go along with a presentation, create audio only lectures or feedback for students. The microphones in most Android and iOS devices are good enough to provide audio for breaking news coverage. WTOP journalist Neal Augenstein has been reporting using his iPhone since 2010 and confirms that you don’t need much to get started with using a mobile device while reporting in the field. His mobile rig consists of his phone and an inexpensive windscreen to cover the mic. Even if you don’t have a windscreen, a clean sock will do the trick. Headphones are a must so you can hear what you are recording. The headphones that come with an iPhone have a built-in mic, one that will always be hot once you plug the headphones into the device. To keep your voice from being stronger than your interviewees, keep one earbud in and move the mic back and forth between you and the source. Finally, have a portable charging device. Something like this one from Mophie allows you to charge more than one mobile device at one time and is not mobile brand-specific. Some optional items to invest in include an external mic, and a drive to move your audio files to if they are taking up too much space on your mobile device, though you can also use cloud file sharing with Google Drive or Dropbox. The number of apps on the market for audio content creation has grown considerably in the past few years. 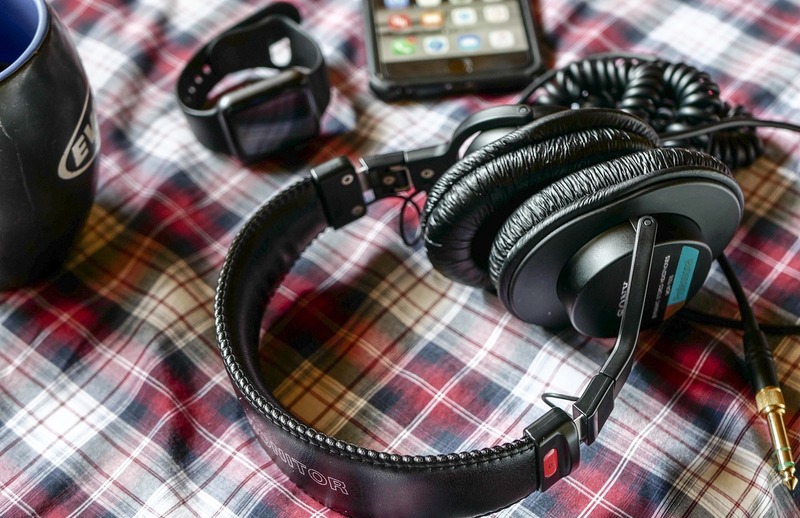 Here are just a few that you could use to produce audio content using a mobile device. Boss Jock Jr. (free; iOS only) is set up like an audio board and you can program your show music, show opening, jingles and more which will literally help you take your show on the road. You can record a phone conversation using SpareMin’s app (free, iOS and Android), but only if your source calls from a U.S.-based phone number. The free version of Ferrite is pretty nifty and audiophiles will like what its capabilities: in-app multitrack editing, easy file labeling, fade in/out, duck (lower music under narration) and a lot more. The instructions are relatively easy to follow, too. It’s nice to see an app that does more than just allow you to trim the clips. Unfortunately for the Android crowd, this one is only available on iOS. With Audio Boom (free; iOS and Android) you can be a reporter on the go with the ability to record, edit and share your work. You could record an introduction to a piece, press pause, conduct interviews and then record your closing to keep your workload to a minimum. The Anchor app has transformed since it first launched in 2015. Then you could record your audio, share it and people could respond, creating a discussion, or an audible thread. One concern about audio has been its shareability and Anchor’s latest update addresses that issue by providing translation of the audio to create a video of the text to match the audio. There are a number of uses for this element, including creating promos and highlighting rich sound bites/actualities that can be shared on social media to bring attention to longer audio projects. Educators can also use this app to make classroom audio content more accessible. These tools are cheap enough and easy enough to use to incorporate into any reporting class. Students are already familiar with their mobile devices and will pick up these intuitive apps quickly. The question is – do they have something to say? Oh, and will people listen? Kim Fox is an associate professor of practice at The American University in Cairo in the Department of Journalism and Mass Communication. You can find her on Twitter at @KimFoxWOSU and if you’re creating audio content using a mobile device, use the hashtag #mojoaudio. Fox also uses #JRMC4460 to tweet out audio resources, the course number for her audio production class.